IN STOCK - DELIVERY TIME: Order before 3.00pm for next day delivery (Monday-Friday). Part of Allett's Expert range of cylinder lawn mowers for general purpose, ornamental and prestige domestic lawns, the Kensington 14K combines multiple unique features to provide unrivalled cutting performance and give your lawn perfect stripes. This four-stroke petrol-engined cylinder mower is recommended for keen home gardeners with lawns of up to 150 square metres. The Allett Kensington 14K is self-propelled and powered by a 98cc Kawasaki engine with recoil start, which is easy starting and has a low emissions rate. The lawn mower is equipped with a six-bladed precision cutting cylinder with a 35cm (14") width of cut, with a fully adjustable cutting height via a stepless micro-adjust knob between 6mm and 32mm to allow users to cut the grass to suit conditions and the desired finish. Delivering 79 cuts per metre, an adjustable static turf rake is fitted as standard to tease out dead material and moss, whilst lifing lateral grasses for improved cutting performance. Perfect stripes are achieved thanks to a combination of the single section steel rear roller with rolled edges and zinc-plated steel front roller with bearings. The large front-fitting grassbox has a 52 litre capacity and provides efficient debris collection and easy emptying. Convenient folding handles allow for easy transportation and compact storage. Equipped with the innovative QC system, the blade cassette can be replaced with an optional scarifying cassette to convert your mower into a powered rake. A 10 blade cutting cartridge for finer, more frequent cutting is also available as an optional accessory delivering an impressive 131 cuts per metre. The ability to remove the blade cassette also assists in the easy and economic maintenance of the lawn mower. Overall Width: 51cm / 20"
A major technological breakthrough came with the birth of the QC exchange concept, which is key to this range of cylinder mowers. 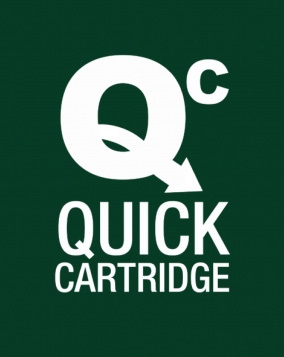 Quite literally, 'QC' stands for 'Quick Cartridge'. One of the biggest innovations in the world of cylinder lawn mowing for over 75 years, it is a system which allows you to remove the cylinder blades from the mower quickly and easily as a complete cassette. You can then either have the blades re-ground or simply replace them with a new cutting cassette. This makes maintenance of your cylinder mower much easier and prolongs its life. The second major benefit of the QC system is the versatility it offers. The cutting blade cassette can be simply removed and replaced by the QC lawn scarifier cassette which immediately transforms your lawn mower into a powered raker. This will clear your lawn of moss and other debris, allowing it to breathe and promotes healthy growth. The ten blade QC cassette ensures an even closer, finer cut ideal for a professional finish to croquet and tennis lawns. Additional interchangeable cartridges form the complete lawn care system for the perfect British lawn. Allett takes great pride in its heritage. 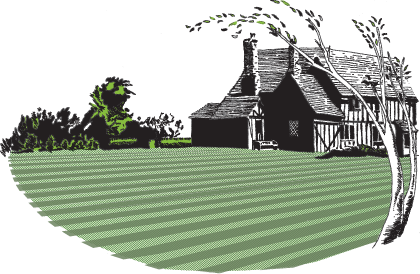 It is a wholly British-owned company which, for almost fifty years, has specialised in the design and manufacturer of precision, single-cylinder, walk-behind mowers. Through its technological achievements, the company has helped produce better, more consistent sports turf surfaces and finer, more beautiful ornamental lawns. The first Allett prototype was a 36" wide machine designed, built and tested in 1965 by horticultural engineer, Reg Allett who, a year later, manufactured and sold his first production mower. Within two years of its launch, the Allett 36" was the professional groundsman's mower of choice and, by the late 1960s, these precision machines were cutting the outfields of every English Test Match venue and many county cricket grounds. They were also trusted to prepare the pitches of leading football and rugby clubs and were specified for use at other sports venues, country estates and public parks throughout the UK, Ireland and continental Europe. Throughout the 1970s, 80s and 90s, Allett continued to develop its professional mower range with the introduction of the 20", 24", 30", 34" and 42" cut machines and by the early years of the current millennium, the professional cylinder mower range comprised specialist mowers for golf and bowling greens, sports stadiums, cricket wickets and outfields as well as public and private parks and gardens. In addition, the company was honoured when the Commonwealth War Graves Commission chose Allett mowers almost exclusively to maintain the grass within its immaculate cemeteries in Britain and all over the world. In August 2007, the company was acquired by the privately-owned Turfmech Group and Allett mower production was moved to Turfmech's state-of-the-art manufacturing centre in Hixon, Staffordshire. Importantly, brand heritage expressed through its distinctive black, silver and gold livery was maintained and continues to be recognised throughout the world. In May 2011 Allett acquired, from Bosch Lawn and Garden, the design and manufacturing rights to the former Atco and Suffolk Punch branded petrol and electric pedestrian cylinder mowers. These have now formed our new “green and gold” Classic and Expert cylinder mower ranges. The addition of the new Classic and Expert domestic and semi-professional cylinder mowers to its portfolio makes Turfmech the largest manufacturer of pedestrian petrol-engined cylinder mowers in Britain, delivering sustained technological advances and complete peace of mind. Today, the Allett brand of professional walk-behind cylinder mowers are leaders within their various market sectors, providing users with expertly-built, reliable, well-proven grass-cutting machines which produce a seemingly effortless first-class finish to every lawn on which they are used. Each and every one of Allett's powerful, smooth running yet quiet machines is supported by exceptional pre- and after-sales care and attention, a service the company is delighted to offer to its customers worldwide.